I remember the first whoopie pie I ever made. After reading up on what exactly a whoopie pie consists of (it’s the best kind of cross between a slice of cake in cookie form), I knew I wanted to try combining two of my favorite flavors: chocolate and mint. I followed a by-the-book recipe from Bon Appetit (they featured my photo as well) and was pleasantly surprised at what I had created. Tasted like a rich thin mint and looked like a giant cake cookie. They were gone in minutes. 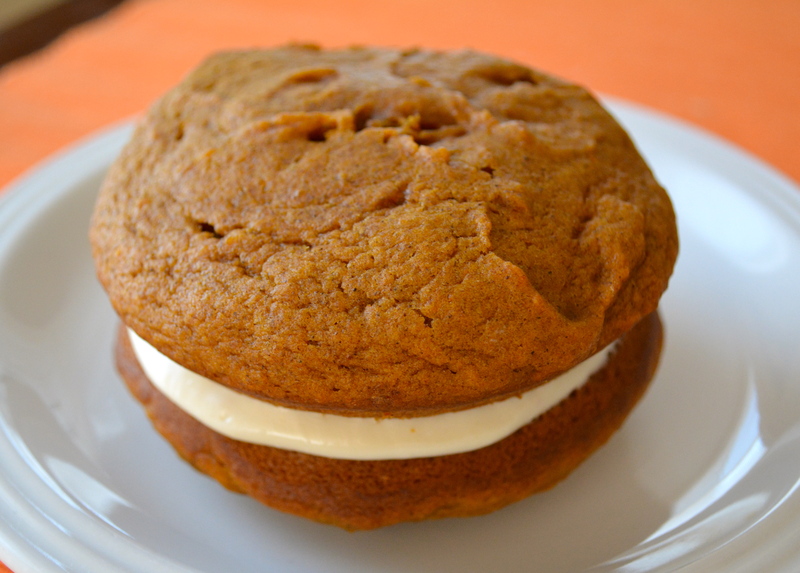 This time, right as the leaves began to change and I had my first glass of scrumptious apple cider, I knew I wanted to recreate a whoopie pie, this time with a seasonal twist. A little over a month ago I was fortunate enough to try a new line of products from Gourmet Garden, the lightly dried herbs. I adore the squeeze bottle herbs and thought those were fun and easy to cook with – turns out, the lightly dried are even easier. They add a slightly punchier herb flavor to your dish, as most dry herbs do, but since they’re only lightly dried, they add a much appreciated texture, crunch and bite that dry herbs can’t provide. For this recipe, I wanted to add Gourmet Garden Lightly Dried Ginger to the frosting – something I’ve never tried before. I like ginger as much as the next person but never really experimented with it in my baking. Again, bad mistake on my part because the specks of ginger were harmonious with the maple frosting. I could eat that frosting all day long. Well, I pretty much did eat that frosting all day long. Tip? Don’t make step 2 of a dessert while you’ve got step 1 in the oven. Why? Because you’ll eat a lot of step 2 and then be left with a very empty step 1 sitting on a baking sheet in your kitchen. Just speaking from experience. 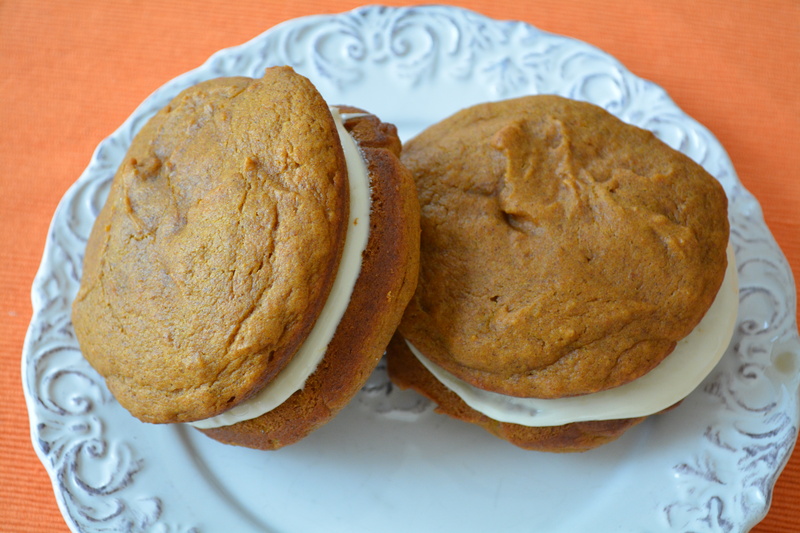 I stuck to a traditional whoopie pie recipe, with the addition of canned pumpkin. You may have heard this before, but if you’re baking with pumpkin, make sure to read those labels. You want plain ol’ canned pumpkin or pumpkin puree NOT pumpkin pie spice or pumpkin pie filling. If you pick the latter, you will have a very different whoopie pie on your hands and who wants that?! Also, I’m the first to admit – this batch of whoopie pies wasn’t my smallest. I (yes, purposefully) made giant whoopie pies. Think of them as giant, sharable, spiced desserts. When my first gigantic pie was being devoured by a friend at my kitchen counter, she looked up at me in between bites and said, “You have to help me eat this. I can’t finish it on my own!” Ten minutes later, she put her fork down on an empty plate sprinkled with crumbs. Moral of the story? Share them. Or don’t share them. Just please, make them before it’s suddenly time to start baking with peppermint. Preheat oven to 350 degrees. Line baking sheets with parchment paper or a silicone baking mat. In a separate bowl, whisk the granulated sugar, the dark brown sugar and the oil together. Add the pumpkin puree and whisk to combine thoroughly. Add the eggs and vanilla and whisk until combined. Use a small cookie scoop or a large spoon to drop a rounded, heaping tablespoon (I used a touch more than a tablespoon) of the dough onto the prepared baking sheets, about 1 inch apart. Bake for 10-12 minutes, making sure the cookies are just starting to crack on top and a toothpick inserted in the middle comes out clean. The cookies should be firm to the touch. Remove from oven and let the cookies cool completely on a cooling rack. Combine butter and cream cheese on medium speed until mixed well. Add the Gourmet Garden ginger and beat well. Add powdered sugar a little at time until blended, then add the maple syrup and vanilla and beat until light, fluffy and smooth. (Resist urge to sample too much frosting while pies are in the oven). Turn half of the cooled cookies upside down. Pipe or spoon (I used a spoon) the filling (about a tablespoon) onto that half. Place another cookie, flat side down, on top of the filling. Press down slightly so that the filling spreads to the edges of the cookie. Repeat until all cookies are used. 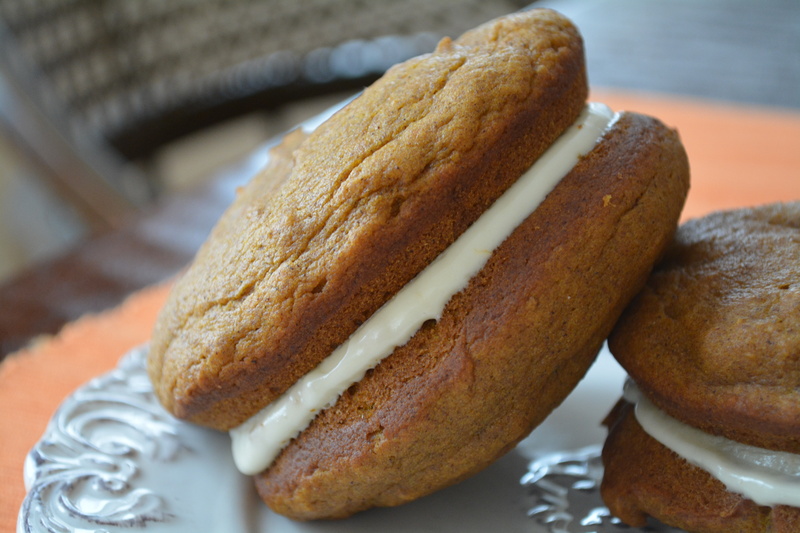 Put the whoopie pies in the refrigerator for about 30 minutes to firm before serving.